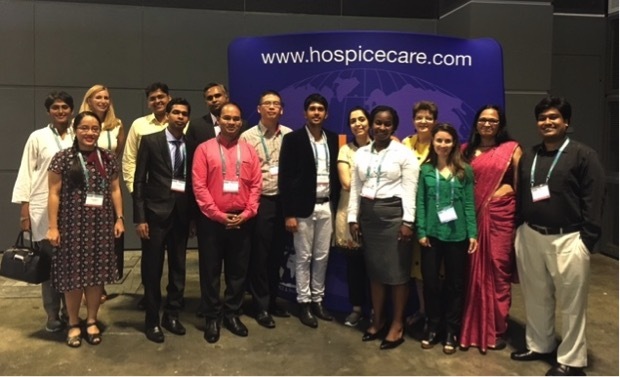 In July 2017, more than 1,600 participants attended the 12th Asia Pacific Hospice Conference hosted by the Asia Pacific Hospice Network. IAHPC was delighted to participate in the conference and to provide traveling scholarships to 18 healthcare professionals from countries in Asia and the South Pacific region. Dr. Ganesh Dangal from Kathmandu in Nepal was one of the grantees. Here, Ganesh describes the challenges of providing palliative care in his country, and how he plans to use what he learned during the trip to overcome them. 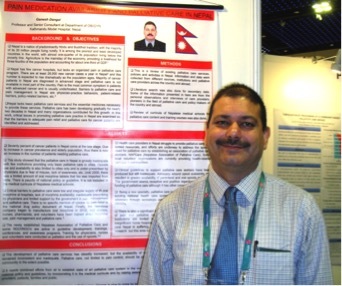 Dr. Ganesh Dangal in front of the poster he presented at the 12th Asia Pacific Hospice Conference: ‘Pain medication availability and palliative care in Nepal’. Seventy percent of cancer patients in Nepal present at the late stage when curative treatment is no longer possible. Yet, because of increased cancer prevalence and an ageing population there is a growing number of patients needing palliative care. Late presentation and thus late diagnosis result from the use of traditional remedies, herbs, and alternative medicine instead of western medicine. Pain is the most common symptom in patients with advanced cancer and is usually undertreated. Barriers to palliative care and pain management in Nepal are caused by lack of professional and public awareness and lack of policy. Palliative care in Nepal is grossly inadequate with only a few institutions providing basic palliative care in the capital city and none at all in small towns and suburbs. Opioids are available and used only in big cities but are under-prescribed because of fear of misuse, lack of awareness, shortage of financial resources, and strict legal regulations. Being a new specialty, palliative care is yet to be incorporated into the existing national healthcare system and there is no national policy or guideline on its provision. Neither is it included in the medical curricula of Nepalese medical schools. There is a significant lack of trained professionals in the field, and a shortage of pain and palliative care specialists. However, informal training and advocacy workshops are being delivered, mainly with the help of local and international non-governmental organizations. Palliative care in the Nepalese context is still unaffordable and unachievable but there is a growing recognition that it is an important component of care for patients with cancer. Everyone should have access to excellent care during the course of a serious illness and at the end of life. By integrating palliative care in our existing healthcare system we can achieve the goal of expanding and upgrading it nationwide. But it needs the combined efforts from us all to establish a state-of-the-art palliative care system in our country by making a national policy and guidelines, by incorporating it in the medical curricula, and by raising awareness among the providers, patients, and the general public. Front row, left to right: Hana Rizadawi Agustine, Supun Prageeth, Shiv Prat Singh Rana, Nuru Festo Milagalila, Lina Rozo (IAHPC Finance Officer). Back row, left to right: Anila Perumal, Genevieve Napier (IAHPC Programs Support and Membership Manager), Sauabh Samdariya, Raghavendra Ramanjulu, Tharin Phenwan, Fernando G. Chamath, Aanchal Satija, Julia Downing and Sushma Bhatnagar (IAHPC board members), Fazel Noor Biwas. Participating in the Asia Pacific Conference enhanced my knowledge, skills, and technical expertise and will enable me to provide excellent clinical care to our patients. As we do not have enough oncologists or palliative care providers in Nepal, giving me the opportunity to attend was an important milestone in the development of the healthcare system of Nepal. The conference was unique and occurred at a time when palliative care has begun to find its place in the healthcare system of countries like ours. The conference not only helped raise the spirits of those who are engaged in this field in resource poor countries, but also increased awareness. Contact Dr. Ganesh Dangal by email. To find out more about IAHPC’s Program Support Grants, and our Traveling Scholarships and Traveling Fellowships, please visit our website. Through these programs we support projects and individuals around the world, especially in developing countries in Africa, Eastern Europe, Asia and Latin America.